Levels of self-harm have risen "substantially" at a prison since its last inspection, according to a report. 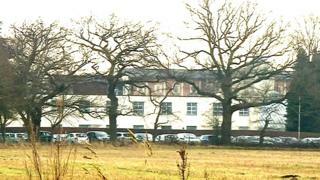 The HM Inspectorate of Prisons said inmates at HMP Stoke Heath, near Market Drayton, Shropshire, spent long periods locked up without activity. One in four prisoners reported feeling unsafe at the category C jail. But the report found the prison is "overwhelmingly safe" and had not seen an increase in violent behaviour since 2015, when it was last inspected. Staff at the jail and young offenders institution were also praised for what they did to stop drugs getting in, but inspectors said use of force by prison staff had increased. Almost half of the prisoners surveyed said they had a mental health problem. The report said there were 260 incidents of self-harm in the previous six months compared with 52 in the same period before the last inspection. Inspectors visited the prison between 12 and 22 November 2018 and found about a third of inmates were inactive and locked up during the day. However, the report also found the prison was well ordered with staff who were clearly in control.